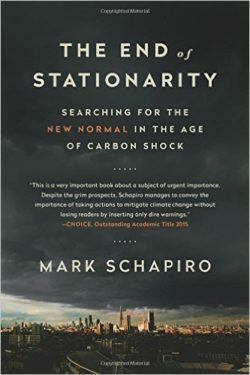 Mark Schapiro talks about his new book The End of Stationarity: Searching for the New Normal in the Age of Carbon Shock. Then, we talk with Greg Palast about his new book and movie, The Best Democracy Money Can Buy: A Tale of Billionaires and Ballot Bandits. For the past 12,000 years at least, human civilization has depended on a natural world that observed largely constant rules. These rules governed how much water we had to grow food, the temperatures that governed our seasons and how severe our weather. But no longer. Now all bets are off as we enter the era of climate disruption. The old normal is gone — and we don’t even know what the new normal will be. The impacts will profoundly shake our economic and political foundations. They already are, as droughts affect food prices in the U.S. and abroad, insurers withdraw from covering coastal properties, and carbon shock roils the energy markets. Investigative journalist Mark Shapiro has been following the widening ripples as the gigantic boulder of climate change crashes into global society. We spoke with him last about his book Carbon Shock. Now he’s followed up with a new book, The End of Stationarity: Searching for the New Normal in the Age of Carbon Shock. Mark Schapiro is an award-winning journalist who explores the intersection between the environment, economics, and international political power. He was formerly senior correspondent at The Center for Investigative Reporting and is the author of two previous books, Exposed (here Francesca’s interview with him about Exposed here) and Carbon Shock. There is no question that the election of Donald Trump, and what appear to be a litany of fossil fuel executives and lobbyists he’s put in charge of climate policy, puts a significant brake on the progress that had been made in Paris, which itself was the fruit of over twenty years of climate negotiations. That said, there is also no question that the accelerating impacts of climate change should provide a jarring wake up call to all Americans as the costs and consequences intensify; and those of us living under a Trump presidency will discover the hard way that fossil fuel production has indeed already been decoupled from economic progress. Donald Trump went around before the election claiming it was rigged. Then he won the electoral college vote and his wild accusations about “voter fraud” died down. But now that a recount is scheduled in Wisconsin and possibly other states — thanks to the efforts of Jill Stein — the Donald is back to his utterly baseless claims that the popular vote, which he lost, was rigged. Investigative journalist Greg Palast agrees that the election was rigged —by the Republicans. And it wasn’t about voters casting ballots more than once, as Trump says — but about millions of minority, poor and young voters being denied their right to vote. His new movie and book about the massive voter suppression efforts of the Republican Party and their billionaire donors is The Best Democracy Money Can Buy: A Tale of Billionaires and Ballot Bandits. The film follows Palast on his investigation of The Donald’s wild claims — and along the way, he finds a secret hit list of a million Americans who lost their vote—and the real story of the theft of the 2016 election. Francesca spoke to Palast in September when the movie premiered — before the election. Here we air an edited version of our conversation — you can hear the full interview here. On December 3, we’ll post an update with him about the recounts on this site. Greg Palast is an investigative reporter whose work appears on BBC Television, The Guardian and Rolling Stone Magazine.